Although wet/dry filters (trickle filters) are the best aquarium filters for saltwater and reef tanks, they are generally a great choice for heavily stocked freshwater aquariums. There are a few types of wet/dry filters, since the only essential components are the trickle mechanism and large areas for bacterial colonization. 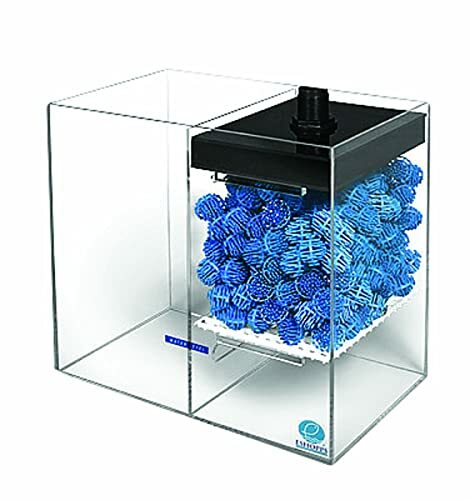 Wet/Dry aquarium filter built in a sump tank, a reservoir of water usually kept underneath the main tank, is the most popular type of this filter. How does a wet/dry filter work? How to connect a sump to a fish tank? 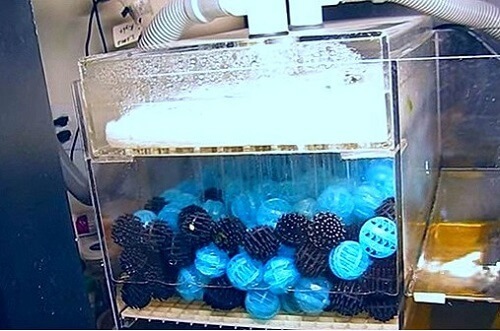 Wet/Dry filters work by trickling water slowly through mechanical media, so that it builds up a good amount of oxygen before passing through the bacterial bed provided by bio-media (Bio-balls are common used). Bacteria need oxygen to process waste, so this process along with lots of surface area makes these the best biological filters you can find. And you’re not sacrificing anything else – wet/dry filters usually offer (or can easily be modified for) complete 3 types of filtration (biological, mechanical and chemical). Power filters or canister filters sometimes include wet/dry biological compartments, greatly increasing the biological filtration efficiency of these filters. Canister-style wet/dry filters are contained entirely within one large, sealed canister. However, sump-style wet/dry filters are most common because of their big advantages. A sump system is really nothing more than a container of water kept outside your aquarium that relies on a siphon overflow system to move water out of your tank, and then uses a water pump to push water back up to your tank after the filtration. You can buy a sump that is divided into chambers for various filtration methods, equipment or refugium use, or you can design your own from an old tank or other container. Sumps increase the water volume in your setup, keeping conditions more stable for keeping sensitive marine creatures, are a good thing to have in any fish tank setup. They also provide room for equipment that can be kept in the sump and out of sight, like calcium reactors, water pumps and protein skimmers. 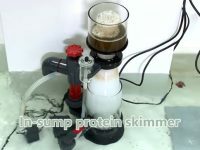 You can configure filter sumps in pretty much any way imaginable, especially multi-chambered sumps. Refugiums – use algae and live plants to consume and prevent the build-up of nitrate and phosphate. You will often see the combination of Berlin and refugium for the whole and best filtration. Bio-balls are small plastic balls ideal for wet/dry filters, and well suited to high pressure flow. They are covered with tiny pegs for immense surface area, unmatched by other biological media. Bio-balls are more economical in large quantities than ceramic rings. Wet/Dry filters that use Bio-balls are great filters for heavily stocked fish tanks both freshwater or saltwater. Although, they can be used for both saltwater for freshwater aquariums, the filters are prevalent in the freshwater because live rocks can replace and outperform Bio-balls in saltwater tanks. For saltwater reef tanks, Berlin filtration systems – wet/dry filters use live rock and live rock/algal combinations are more natural and require less maintenance. Berlin filtration system is the best Wet/Dry sump filter with live rock and protein skimmer used for saltwater reef tank. Named for their place of origin, they have grown tremendously in popularity, prized by reef purists for being natural and low maintenance. Live rock – Live rock is porous remnants of corals and reef rock taken from or cultured in the ocean. 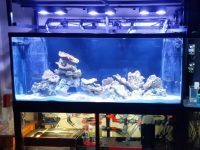 Live rock is nature’s way of filtering the reef, and the saltwater aquarium hobby has grown to reflect the consensus that this is also the best method of filtration in captive marine systems. 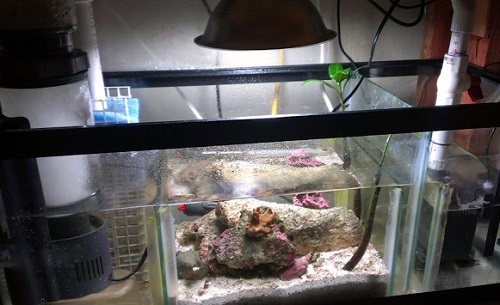 In a Berlin system, live rock is placed in the sump tank. Live rock available in the industry is one that arrives pre-colonized with denitrifying bacteria, beneficial photosynthetic algae and other microorganisms that serve as natural filters in a reef system. 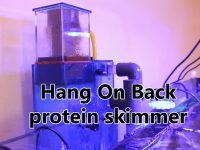 Protein skimmer – A protein skimmer is one of the most important devices in saltwater aquarium and is the most efficient way of removing organic compounds (protein, amino acids, etc.) from the marine aquarium water preventing them from breaking down into nitrogenous toxins, which is dangerous for fish and other organisms living in the saltwater aquarium. Aquarium lighting – Intense lighting is also needed to keep organisms on the live rock healthy – new technology LED aquarium light or high output T-5 fluorescent lighting is finding some popularity in the reef world. The drawback of a Berlin filter is that there is limited space in a sump for live rock, and in very large or stocked tanks you may not be able to fit enough rock to process all that waste. 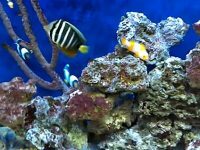 However, the new standard in the saltwater hobby is to keep live rock in your tank also (or even instead, foregoing the sump altogether – a great option for more lightly stocked tanks). Wet/dry filters are excellent at converting ammonia to nitrites to nitrates, but in a heavily stocked system, this means high levels of nitrates can build up, beyond what can be controlled by regular water changes. Saltwater organisms, especially delicate reef organisms, have a much lower tolerance for nitrates than freshwater fish do – in the ocean ecosystem, abundant algal and microbial plant life keep nitrate levels low. Algae filtration is another natural approach that has become a conscientious standard in the saltwater and reef aquarium hobby. Algae consumes nitrates, just like any plant. Therefore you can use it as a filter by culturing it in a refugium section in your sump. Many saltwater aquarists try to culture strains of macroalgae – larger algae that resemble plants or seaweed – that would actually exist as natural filters in the ocean. The combination of a Berlin filter system with an algae filter in a sump produces very clean, healthy water with very low maintenance. 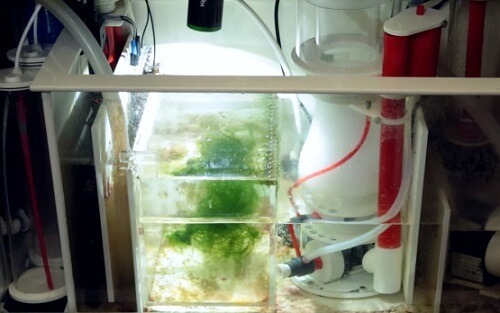 The refugium chamber should placed after the live rock chamber, so that the macroalgae is filtering out the nitrates produced after wet/dry filtration. As with live rock, macroalgae need appropriate lighting for photosynthesis. When connecting a sump to your tank, you can’t just plumb straight into the water – in case of a power failure or plumbing malfunction, this could lead to much or all of the volume of your aquarium being siphoned out, with tragic results. Instead, your piping feeds into and from siphon overflow boxes designed for this type of system. 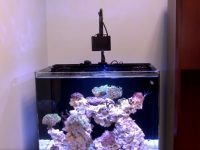 You can purchase these devices to attach to your tank, or you can buy a reef ready aquarium with a built-in overflow box. During power outages, back-siphoning can be a problem. Water is coming into your sump, since siphoning is automatic once started as long as water levels are high enough; but your pump is shut off so water can’t flow back up to your tank, flooding your sump. Some overflow boxes come with features that prevent this; there are also DIY plumbing solutions to these problems that you can look into if you’re handy. You must also keep your water level from dropping due to evaporation to prevent flow problems. You can cover your sump to cut down on evaporation; you can also purchase automatic refill devices to help. If all this sounds complicated, it can be these systems might require you to purchase more equipment or do more planning/construction up front, but once established, you won’t be buying replacement cartridges and maintenance costs should be low. Wet/dry filters contained within sealed canisters obviously simplify all this, but they lack the benefits that come with sumps, especially in a saltwater system. In addition to keeping equipment out of sight and increasing your water volume, sumps are a convenient way to add trace element supplements, additives, and new water very gradually, preventing shock to your system. If your sump is partitioned into chambers, you can use one as a refugium for damaged or fragile organisms, or to culture live foods like plankton, macroalgae or brine shrimp. The chambers come after the filtration unit, so they benefit from the same water conditions as the rest of your system, while remaining protected from the inhabitants of your main tank. Berlin filters are the most natural and easiest wet/dry filters to maintain, but may not have the bio-load capacity of other wet/dry sumps. Still, the Berlin filter/algal filter combination is the most popular and effective contemporary method of conscientious saltwater aquarium keeping. 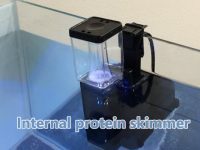 With any style of saltwater wet/dry filtration, a protein skimmer is a wise and, most aquarists agree, vital addition, reducing the load on your biological media to keep everything running smoothly. It’s important to maintain water levels and to clean pumps every six months or so, to make sure that proper flow in and out of your system is occurring and prevent overflow situations or filter flow loss. The bottom line is that wet/dry filters are powerful and efficient, and there is no better biological filter for heavily stocked systems like reef tanks, but there are challenges involved that make them less suited to beginners unless you go with one of the canister systems, foregoing sump benefits but simplifying setup and, possibly, maintenance. If you want to use a wet/dry sump, I strongly recommend that you look into some of the ways that aquarists and hobbyists set them up successfully. There are many online forums, blogs and websites that can offer you advice and examples to fit your own needs!